This image was included on the stamp design around the edge of the “Ashes to Ashes” single. The 7″ was released 1st August 1980 on RCA records and had three cover variants all shot by Duffy. The graphic markings on the single sleeves were done by Bowie with a marker pen. Some copies of the record came with an extra sheet of Duffy images made to look like postage stamps. This print is also available as part of our Scary Monsters Contact Sheet #1. This outfit and makeup were also worn in the “Ashes to Ashes” music video released in 1980 and for the three cover versions of the 7″ single. This image was included on the stamp design inserts created by David for the inclusion with the “Ashes to Ashes” single which had three cover variants all shot by Duffy. 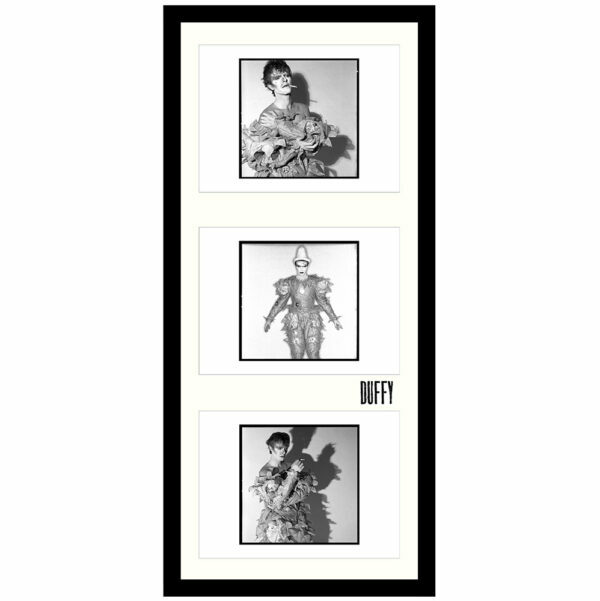 Our framed triptych has a selection of 3 images from one of the five sessions Duffy shot with David Bowie. The Triptych is embossed and stamped on the front with an info sticker on the rear of the frame. The frame size is 53x26x3.5cm and the images are 10x10cm each. These make a wonderful gift or addition to any Bowie collection.